When your car's air conditioner isn't cooling anymore — or worse, blowing hot air — it can make for an uncomfortable ride on a warm day. The solution could be a simple one, but it could also require a complex repair that would be risky to attempt at home. There are two basic types of problems you can experience with your car's air conditioning. Each one will have different symptoms, and different potential solutions. Choose your issue below to see more details. While there are a variety of reasons your car's air conditioning might not be operating at top performance, the most common are a refrigerant leak, an electrical climate control issue, or a problem with the air conditioning compressor. Each of these can cause the AC to blow lukewarm or hot instead of cold air. Your car's air conditioning uses refrigerant, a fluid designed to vaporize at a low temperature, to cool the air before it blows through the vents into the passenger compartment of the vehicle. If that refrigerant is leaking from somewhere in the AC system it will become less effective at cooling the air before it leaves the vents. A leak like this can be the result of a faulty component within the system, such as the compressor, evaporator or hoses. Or, it can just be a sign of age for an older vehicle, since the parts and hoses use rubber seals that naturally tend to wear over time, causing the refrigerant to leak. Accidents and other damage can also cause refrigerant leaks. 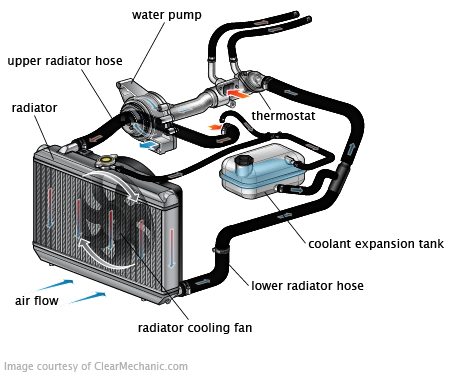 Since the AC condenser is located in front of the radiator, it's susceptible to damage from flying road debris and other small front-end impacts. Another possibility is that AC hoses and pipes can rub against other parts while you drive, eventually causing a leak. One way you can verify this is by listening to the AC compressor. You should hear an audible click from the engine area when the AC is turned on. This is the compressor clutch engaging, which allows the compressor to operate. When a system is low on refrigerant, the compressor will cycle on and off frequently. If the system is very low, the compressor will not turn on at all. The system must be checked for leaks; any leak found should be repaired and the system properly evacuated and recharged. Solution: If a specific part of the AC system is the culprit, the repair will involve an inspection and repairing or replacing the offending part. If enough refrigerant fluid has already been lost, a full AC recharge will also likely be necessary in order to flush the system and replace it with the right amount of refrigerant to function properly and keep air blowing cold. Note: Refrigerant is a dangerous and toxic chemical, and should be kept from escaping into the atmosphere. Because of this risk, only trained technicians with the proper equipment should perform air conditioning repairs. The buttons, knobs and control screens that you use to adjust the temperature in your vehicle tell an AC/heater control module — basically a computer — to pass instructions to the heating and cooling system. Just like with any electrical tool or appliance, this component or the parts that support it, such as electrical wiring, can break down or fail for a variety of reasons. As a result, your car's AC could start to perform inconsistently, or even stop working altogether. Solution: Due to the complex nature of the electronics in this system, an experienced and trained technician will need to evaluate the components to diagnose the true root cause, and ultimately repair or replace the faulty parts. You can help by clearly communicating and demonstrating the symptoms with the shop before they start working to fix this issue. The compressor is an extremely important part of your car's air conditioning system. Its purpose is to move refrigerant through the system, and compress low-pressure refrigerant gas into high-pressure refrigerant gas before passing it to the AC condenser. If this crucial component starts to break down, it will mean refrigerant can no longer be reliably moved through the system, so air blowing through the vents can't be cooled. The compressor must turn on for the AC system to work. The compressor belt and the electrical circuit to the compressor must be in good condition. If the belt is OK, the mechanic will check for proper power supply to the compressor. If that checks out, then the compressor has likely failed and may need replacement. If the compressor failed internally, then metal shavings may have been distributed throughout the system. This would require a system flush and potentially the replacement of other damaged parts. Solution: An inoperative compressor is normally due to low refrigerant or loss of power to the compressor. However another solution may involve an AC compressor replacement. The blower motor is an electronically controlled fan that blows air into the passenger compartment. The motor can stop working for several reasons, all which cause the flow of cool air to cease. There are a two main reasons this occurs: the motor or the system controlling it have failed. These control systems are quite simple. You have a lever or knob, a cable, and a cable-controlled door or flap. When you move the lever or knob, the cable opens and closes the door, changing the direction of the airflow. The problem is usually broken cables, but the controls can break, as well. These systems use vacuum to operate a vacuum motor (or diaphragm), which in turn operates a door or flap. The controls can be mechanical or electronic, but the system will use vacuum hoses to transmit vacuum to the vacuum diaphragms. Most of the time, the problem is a vacuum leak. Typically, when these systems lose vacuum, the airflow is automatically directed to the windshield — this may be constant or it can occur just when you're driving. If the airflow stops when you're accelerating, this is likely due to a vacuum leak. Most newer vehicles have an electrically controlled system, which uses electric motors to change the door position. A control module will send a voltage signal to the appropriate electric motor, which opens and closes the door accordingly. Some vehicles can have problems with the motors, while others have control module issues. Whatever the cause, these systems take electrical diagnostic skills to be able to diagnose and repair. John Gower is an automotive expert at RepairPal, the leading online source of auto repair resources and estimates. With many ASE Master certified mechanics on staff who have decades of experience, RepairPal knows all the fine points of car repair.